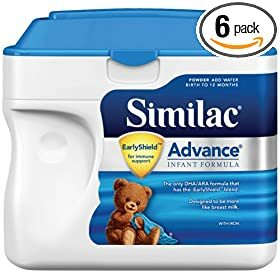 If you don't have formula checks and your baby uses Similac Advance EarlyShield, this is the best deal out there for Similac right now! Pick up a 6-pack of 23.2 oz tubs of Similac Advance EarlyShield powder infant baby formula for $122.99. That ends up being just under $20.50 per container! You'll also get free 2-day shipping on your order. Not bad for a bunch of formula delivered right to your doorstep! This IS a great deal! Those tubs are $27.99 each at BJ’s. Thanks for the heads up!